I was scrolling through our vacation pictures from this past spring when this shot of a cafe caught my eye. I wasn't sure what pulled me in. It's certainly not that it's a perfectly composed photo. It's a bit busy, the light fixture at the top left intrusive, the yellow building with the shutters and charming grey and white striped awnings cut off too soon. But I love it. Why, I wondered. Because it takes me back to such a happy period? Of course that's part of it. On the left side, out of range of the photograph is the small market where my husband and I would buy bananas, yogurt and pain du chocolat in the morning. Learning how to use the machine at the grocery store to weigh the bananas, figuring out how to make ourselves understood to the clerks at the checkout line, part of the fun of being adrift in a city where you don't speak the language. When your Ou est? and Combien? are not quite enough. 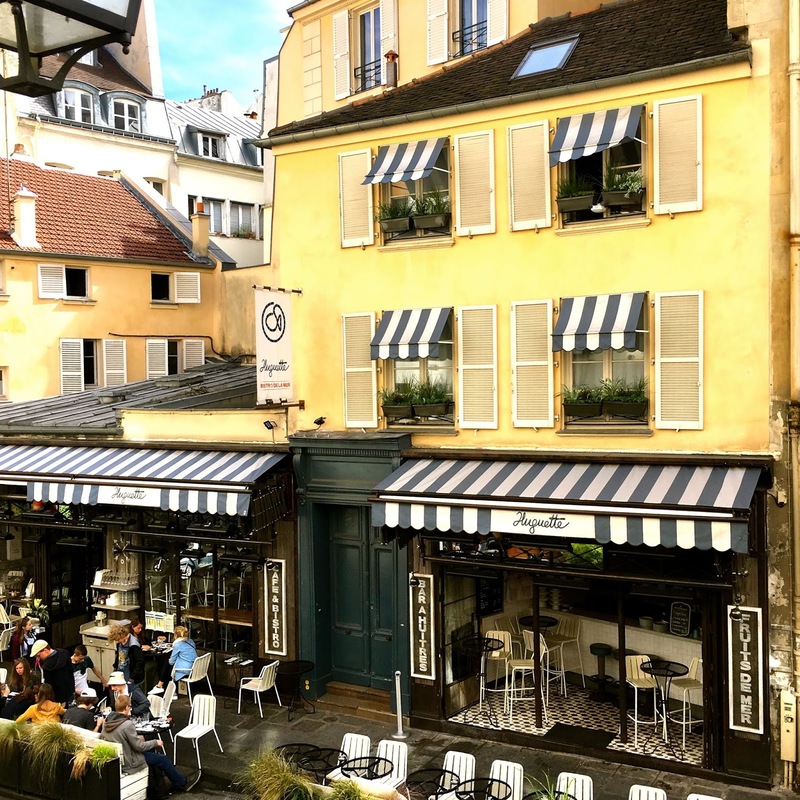 The view of this cafe across the street from our hotel is what we looked at while we ate our breakfast before wandering out to the Boulevard Saint Germain and beginning our day. But there was something beyond that pleasant memory that intrigued me and I realized that it was the inadvertent position from which I snapped the photo. The height giving me a bird's eye view very much like a cameraman sitting high atop a crane, shooting down into the street below. Except instead of a real street, this felt to me like a Parisian street built on a studio soundstage. To my American eye, the cafe looked about as real as a painted backdrop in an old 1940's movie musical ala An American in Paris. Not a lot different than the European section of the Universal Studios backlot where I worked as a tour guide for a couple of years. The walls made of plywood, bricks of foam rubber, empty facades, nothing behind them. Is that what it boils down to, why we Americans love Paris so much? Because it doesn't seem real? While back home we wrestle with the real problems of family, work and the larger issues of the country we live in, fire, floods, hurricanes, a country divided, is Paris our ultimate fantasy? Forget that they have troubles of their own! Do we have to escape into this fictional place with its' fading painted shutters, peeling paint, and window boxes of never-dying flowers to find a cafe where we can leave behind the lives we really live at our own little bistro table for two? For a few days, a few weeks, however long you are fortunate enough to stay in Paris, it certainly feels that way. Posted for Dreaming of France hosted by Paulita Kincer at An Accidental Blog. Hmmm. Deep thoughts. I do love Paris for the fantasy, but also the history and the beauty and the deep breaths I can take there. Beautiful pic and musings. I was shocked on my first visit to Paris when I saw people on the Metro looking bored! It seemed incomprehensible to me that they could be having their humdrum Metro ride to work in Paris, that they were depressed, that they hated their job, or were plotting their escape- who knows maybe to Australia? Have you tried apartments instead of hotels? So much better I think. Louise, I love hotels in Paris for the breakfasts! We usually only stay a few nights in Paris at the beginning or the end, so we book those along with our flight. The price for the flight and three nights in a hotel is about the same as the price for our flight, so it's like getting them free. Staying longer in Paris, it definitely makes sense for an apartment. I feel the same way, Louise. And I'm always shocked when I meet someone here in Los Angeles who has moved away from someplace wonderful—France and yes, Australia! Our troubles travel with us, no matter the geography or the architecture.